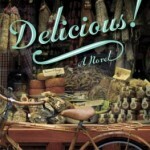 I savored Ruth Reichl’s first foray into fiction (sorry for the pun – couldn’t resist!). I vacillated between eagerly turning the pages and pausing for a break, simply because I didn’t want the story to end. In Delicious!, we meet Billie as she prepares for an interview as the assistant to the editor of a food magazine. In the engaging characters she encounters, the mouth-watering food she describes, and the foodie side of New York City she explores, the reader is drawn in to all of Billie’s new experiences. With an unexpected WWII tie (Billie discovers letters between James Beard and a precocious 11-year-old Lulu), a mystery, and unresolved family issues, this book is hard for me to describe – other than it was lovely and wonderful and completely worth a read.